There are six provinces There are six provinces in Costa Rica, Limon, Puntarenas, Guanacaste, Heredia, Cartago, Alajuela and San Jose. In each of these provinces there are many activities and adventures for you and your family to experience. We will show you the best things to do in Costa Rica. Guanacaste is one of the best province to visit if you are traveling to Costa Rica with kids. In Guanacaste, children are welcomed and celebrated because the tradition and culture of Guanacaste centers around family. Crafts and cultural activities usually offered at the resorts in Guanacaste. A lot of fun is waiting you, like fishing, beach games, nature walks, surfing lessons, ATV tours, zip lining (canopy) tours and a lot more. 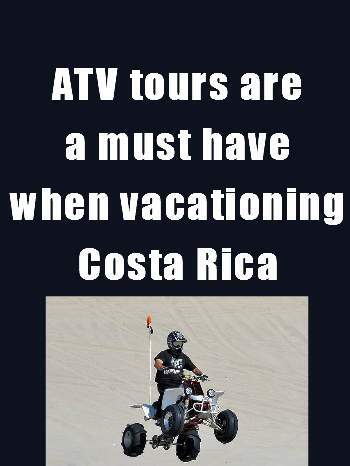 In Guanacaste we can recommend a lot of good ATV tours, such as the beach ATV tour in Playa Tamarindo. Playa Tamarindo is the most popular beach town in Guanacaste and Costa Rica. Click here and discover the best from the best Tamarindo ATV tours. Puntarenas also has some great family adventures available. Puntarenas and Guanacaste are guarantees for good weather. You can rent a boat for a fun tour (swimming, snorkeling and much more) and you will have the opportunity to meet dolphins, sea turtles, stingrays and so on. For families ideal are horseback riding tours. Ask your host for the best tour operator. If you have enough time I highly recommend to visit also the caribbean site from Costa Rica. Beaches with cristal clear sand and water. You will not be disappointed. Are you a diving fan? This part of Costa Rica is definitely the best for scuba diving, because the very good visibility. Guanacaste and Puntarenas are the best provinces for your vacation but they are not crowded, which makes it attractive to families for safety. There are still a lot of things for families to do in Costa Rica.